This is “Not” the key to my Wireless Network. However it is the HD-DVD processing key that is used for most HD and Blue Ray movies released so far. Now for those of you not in the know, here are some terms that you need to know. For more information on these terms check Wikipedia. AACS is an integrated set of technological protection measures that controls access to and prevents unauthorized copying of copyrighted motion pictures embodied on high definition DVDs. What this means is that this is the Hex Key needed in software used to decrypt and watch HD-DVD movies. Both HD-DVD and Blue Ray media use AACS DRM to protect there content. Of course due to the revocation procedures introduced in HD-DVD’s encryption scheme this key will not be good for long. However the procedure for getting the key has already been figured out by an anonymous programmer called Muslix64 and is implemented in a program he wrote called BackupHDDVD. However if that were not bad enough, there is now a new hack. This one is a hardware based AACS attack, that uses the Xbox 360 HD-DVD drives and that hack cannot be revoked. It is accomplished by de-soldering the HD DVD drive’s firmware chip, reading its contents, and then patching it. If all this sounds familiar, it’s because the standard DVD decryption in use today was cracked by three people, two of which remain anonymous, however the third in this trio was a Norwegian named Jon Lech Johansen whose home was raided by the police and he was placed on trial for violating the DMCA. He was acquitted of all charges in early 2003. Others were prosecuted just for posting or linking to the DeCSS source code. I think this just goes to show that nothing is ever really secure. Songbird just might be to music what Firefox was to web browsers. So what is Songbird? 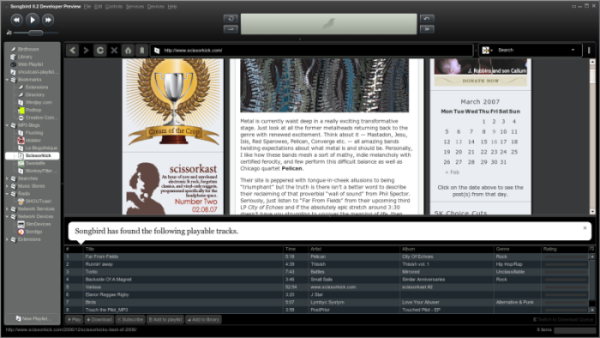 Songbird is a cross platform open source project for playing music like iTunes or Winamp, a web player capable of playing media files off the internet or on your PC, as well as a web brower, all in one interface. Being Cross platform means that Songbird will work on your Windows, Mac, or Linux computer. Songbird is based on the Mozilla XUL platform. XUL stands for eXtensible user-interface language, which is also what Firefox is also based on. Songbird also supports a number of file formats such as AAC,MP3, OGG, FLAC,WMA and more. With support for over 45 different languages. Currently the application is at version 0.2.5 which is a developer preview release of things to come. While the product is not quite ready for prime time and there are some bugs that still need to be worked out, progress is moving along quite nicely with new features and add-ons being developed everyday. So will this be the next big music app? Only time can tell, but it’s off to a nice start. Like the phones we use today it was only a matter of time before computer networks went wireless. As we shall see as with most network technologies this also has its pros and cons. Wireless networks give their users a lot of freedom. They could setup and use their equipment any where they want to within the range of their wireless signal. In large companies wireless networks can save lots of cash expenses on wiring labor and equipment cost. The technology is also being used to bridge two networks together as well as providing service to End of Service areas (EOS). There are currently three major types of wireless networks. They are 802.11B, G, and A. The 802.11 part is the IEEE specification for wireless networks. 802.11B offers user’s network speeds up to 11Mps. 802.11G offers users up to 54Mps. While 802.11A offers users up to 54Mps speed also, however in a different spectrum. One fact to take note of is that both 802.11B & G networks operate in the 2.4 GHz radio spectrum, while 802.11A operates in the 5 GHz spectrum. This can be an important fact when dealing with the issue of interference from other devices such as cordless phones or microwave ovens. The major issue when dealing with wireless networks is security. Prior to encryption standards being released, data was being passed in plain text. This allowed anyone with the right equipment to view what may have been sensitive information. WEP was the first major encryption standard to be release for wireless networks. Its purpose was to encrypt data as it was being sent from point to point. This encryption involves the use of a key to encrypt and decrypt the data. The problem with WEP is that it was found that the WEP key could be easily determined given the correct tools and a little time. The tools necessary to crack a WEP key can be found with just a little searching on the internet using Google on the term WEP. WPA without getting overly technical is an improved form of encryption. In simple terms, WPA improves encryption by automatically changing the encryption keys (called Rekeying) and is authenticated between devices after a specified period of time. This Rekeying process is what makes WPA superior to WEP and provides stronger protection for the end user. Use WPA or if you have no choice use WEP 128bit or Higher Encryption. Use PGP encryption when sending emails. Remember nothing is secure; our job is just to make it harder for the bad guys to make us a victim. Hopefully they will just move on to a easier target.